Just wanted to drop a note to say “thank you” to you and your staff. Our event at Heinz Field was a huge success! Everything ran like clockwork and the staff could not have been more supportive. Marie & Joe were wonderful, the food was delicious, and your tour guides – I wish I could bottle their enthusiasm! We will definitely be back! Again your staff was wonderful for our prom on Friday. Joe is a goldmine. He was very accommodating to our needs. The food was fabulous and plentiful. The facility was clean and well-maintained. Last night’s event was amazing! We are so grateful to you and your staff for helping make it so successful. Everyone was so accommodating and gracious. Please let them know how much we appreciate them. The venue looked great, and the food was first class. Everyone commented on it. Thanks again for all your help. The prom was wonderful! The kids were so happy. Thanks for everything. Please pass onto your staff how wonderful we all thought they were. Everyone was so kind and helpful….we will be back in 2017! Meg! You and your team were amazing! I’ve been getting great feedback since even before the event started! We had no complaints, everything looked great, everyone was super helpful. What a great night. What a great event. Our guests really enjoyed themselves and loved the venue. I honestly think some of our guests’ favorite part of the entire evening was seeing the RAND label on the elevator button. It’s the little things. We are so grateful for the level of attention you paid to our group. Things ran smoothly. It was nice to have your presence there in the beginning to make sure everything was as it should be. Dave handed off the video and audio tapes to me at the end of the night and I can’t wait for our multimedia crew to do some editing so I can re-watch and pay attention with a different (non-event) hat on. And Karl was a super great guy – so easy to work with. Can’t wait to see the pics. Thank you, thank you for making us feel welcome and taken care of. I want to extend my heartfelt appreciation for the work your team put into the Pittsburgh Film Office’s “Lights! Glamour! Action! event on Sunday. I truly love working with everyone at Heinz Field. However, Sunday’s event presented many challenges and I want to call out, personally, each person who helped make the event a success (and helped me keep my sanity). First, you should know that NO ONE on the staff ever says no to a question or a request, rather, I get an answer like, “Let me see what we can do.” I think this attitude is pretty unique to Heinz Field, and very much appreciated. Cayce, Melanie, Meg, Rachel, Cookie, Marie and Dave — we leaned on them heavily and they never let us down. Chef Scott did an amazing job on the food – we got rave reviews on the food! 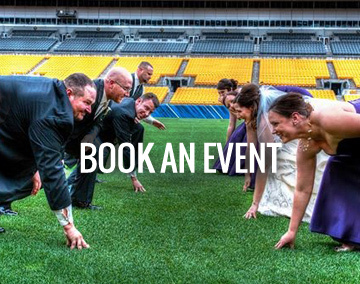 I am looking forward to working on at least two more events at Heinz Field this year – and am always happy to recommend your excellent team to others. Words cannot begin to express my sincere appreciation for all of your wonderful assistance during the planning and execution of last evening’s dinner. In all my years at Duquesne (and they were many!!) with the many events I have had to coordinate, I have never collaborated with more efficient, detailed and delightful people. But then again everyone in the Steelers Organization is wonderful from the supervisors to the wait staff. Terrific people!